The local area is a very popular tourist destination and many local options are available, including camping, holiday cottages/lets, hotels, B&B’s etc. Early booking strongly advised. There are many regional camping options, below is a selection of nearby camping options who are aware of the event and can offer you a good service. Booking should be made directly with the campsites. South Lytchett Manor Provide a range of camping options including electric and non-electric pitches, touring pitches and clamping units. Ideally suited for families and have 10.30PM quiet. Tell them who you are with and they will allocate pitches accordingly. Back of Beyond Touring Park ADULTS ONLY, sorry this does not mean it is one of those sites! It is described by the owners as a â€œTranquil Parkâ€ and would suit the more relaxed masters competitors. they offer a number of electric pitches for Tents, Caravans and Motorhomes and a limited number of â€œSimpleâ€ tent pitches within the Glade, Min 3 night stay. Rockley Park Rockley park provides modern static caravan accommodation with everything you would expect from a Haven holiday park. St Leonards FarmRun by James Love and his family, this site are flexible to allow you to book as clubs or simply say that you are with the SLSGB event and which club and they will book you in accordingly and make sure you are located together. Shorefield Shorefield are our largest local supplier of camping, touring, static caravans and lodges all within 30 minutes drive of the beach. Phone them to discuss your needs they will accept some group bookings or are happy to allocate pitches in close proximity. Burn Bake Burnbake is a firm favourite locally for a group weekend away as they have an event field that you hire as a group. 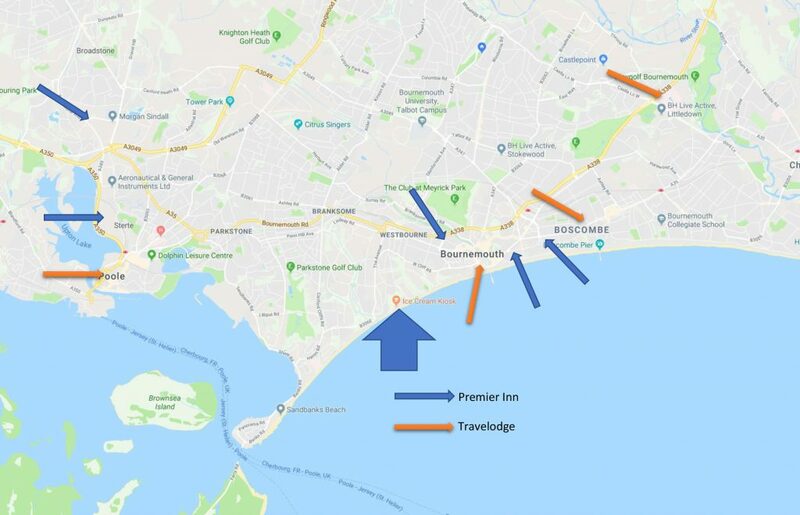 Travel to and from the site does involve a using the Sandbanks ferry (http://www.sandbanksferry.co.uk/) which is currently GBP4.50 per car each way or a 45 â€“ 60 min drive, make sure you stock up on provisions before hand as there is no shops in close proximity. Dorchester House 500 rooms available individually or in bigger groups. Very near Bournemouth railway station, suited to larger group/club bookings. Accomodation is double rooms with a shared kitchen and can be booked in clusters (e.g. 7 rooms + shared kitchen or 6 rooms + shared kitchen). Rates are GBP30 to GBP59 a night for a room but this is negotiable if you can book in larger groups. Contact Silva Bala to book on 01202 941020 or mobile 07519 122784. Student Roost Student Roost 2 sites, 1 in central Poole and 1 in central Bournemouth. Larger group bookings only. Contact 01202 649670. The Blue Shutters Guest House in Parkstone is a family run guest house that kindly offers 10% discount for event attendees. It is situated in a lovely area of Parkstone 3km from the event. Available are 2 single rooms (GBP80 per night) 4 doubles (GBP108 per night) 1 twin (GBP108 per night) and 2 family rooms that sleep 3 (GBP118 per night). Call Anita on 07985 645313. The promenande is fronted by beach hits right along the 5km stretch of beach between Sandbanks and Bournemouth pier (2.5km from centre of event in either direction). Although not permitted for overnight accomodation they can offer some respite from the busy beach/sun and can be used for secure overnight storage. Some of these are avialable for hire and See the website here for more information.